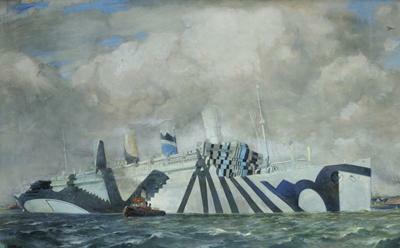 Historians at the University of Southampton are holding a study day devoted to learning, discussion and exploring new perspectives on dazzle painting, also known as dazzle camouflage. Dazzle painting was invented by the artist Norman Wilkinson in 1917 to help offer some protection from German U-boats to British and Allied shipping. Bold irregular patterns of colour were painted on the sides and superstructure of merchant and naval ships to confuse submarine commanders targeting vessels. The camouflage was designed to confuse, rather than conceal. Torpedoes were fired in anticipation of where a ship was heading and dazzle aimed to break up the constructional lines, making it difficult to identify a ship and estimate its speed, range and course. 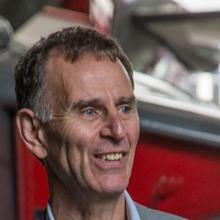 Thousands of merchant ships and hundreds of naval vessels were ‘dazzled’ in World War One. The development of dazzle in Britain is now the subject of a new exhibition DAZZLE: Disguise and Disruption in War and Art at St Barbe Museum and Art Gallery in Lymington (16 June – 23 September 2018), curated by the art historian Dr James Taylor. To complement this, the University of Southampton is staging a study day (30 June 2018), of the same name, developed by Dr Taylor and Southampton’s Adrian Smith, Emeritus Professor of Modern History. The exhibition features paintings, prints, drawings and artefacts on loan from various private and public collections including: the British Museum, Imperial War Museum, National Maritime Museum, Southampton City Art Gallery, Tate Britain and V&A Museum, as well as the estate of Norman Wilkinson. The study day will host a wide variety of speakers including: Camilla Wilkinson, architect and granddaughter of Norman Wilkinson; Simon Stephens, Curator of Ship Models at the National Maritime Museum (NMM) and Sue Prichard, Curator of Decorative Art, also of the NMM. Dr Taylor, a former Curator of Fine Art at the NMM, will reveal, for the first time, details of around 18 dazzle officer artists. The event programme will cover a range of topics, such as, the origin and testing of the camouflage, the role model ships played in its development, the artists who brought dazzle to life and dazzled ships on the River Thames during World War One. The study day is part of a University of Southampton project called Great War: Unknown War which began in 2014 and aims to commemorate key aspects of World War One through a variety of events including, concerts, study days, lectures and exhibitions.